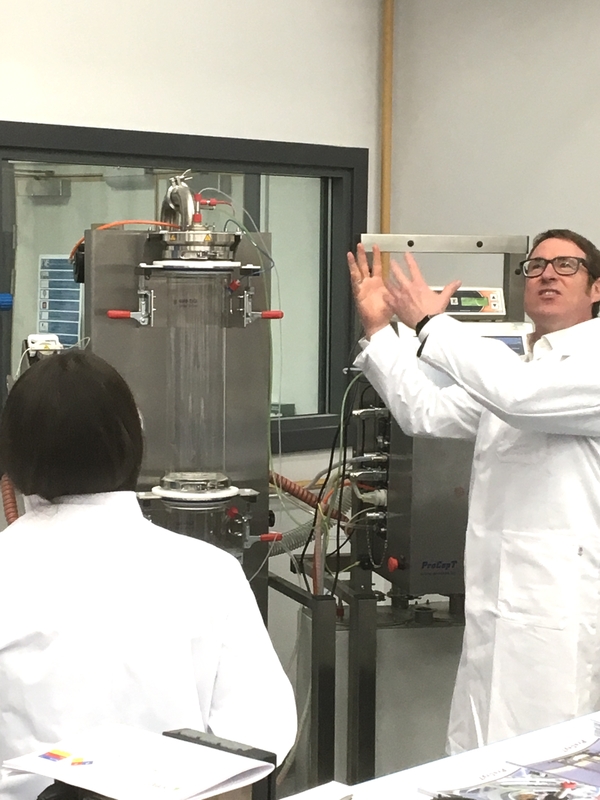 Spray Drying in action: Filip Van Der Gucht of ProCept leads a live demonstration of spray drying at the University of Leeds course. Small can be beautiful of course but sometimes events can improve while they grow in size. The fourth “Spray Drying and Atomisation of Formulations” course, hosted by the University of Leeds, is a case in point. Starting in 2014 with around twenty delegates and two days of content, the course is now three days in length with over twenty presentations, six laboratory demonstrations, seventeen lecturers (from industry and academia), sixty delegates and one ever-popular course dinner. Each year I am impressed by how many new applications for spray drying are discussed, either in the formal sessions or during the informal opportunities to talk. In 2017, delegates came from all parts of Europe and some from further afield. There was a big contingent from the pharmaceutical industry (where spray drying is really gaining a foothold for a number of uses) as well as from food & drink (think infant formula milk), speciality chemicals, agrochemicals, detergents and ceramics. Although the science of spray drying is well understood, during the panel sessions, the expert lecturers were of the opinion that progress can still be made in predictive modelling and in-process analytics. Challenges still remain in energy recovery and (for pharmaceuticals) to make the technique a more universal alternative to freeze drying. As ever, thanks should go to the energetic organisational support from the CPD team at the University of Leeds Faculty of Engineering who have had to deal with an increasingly complex course over the years. The 2017 course was sold out, so to make sure you don’t miss out in 2018, have a look at the course web-page and then – to express an interest in attending – please email cpd@engineering.leeds.ac.uk.